Bobcat Australia the company that pioneered the compact equipment industry in Australia with skid-steer loaders unveils the Bobcat 5600 Toolcat Utility Work Machine that will once again revolutionise the way work is done. The Toolcat work machine is a result of many years of planning and development in the USA by the Bobcat company, which has provided many customers with innovative equipment solutions. The result is a new compact product category called utility work machines. The design and functionality of the Toolcat work machine was based on feedback from compact equipment users and owners in several markets. Research showed equipment users were looking for a steerable machine that would work well on all surfaces and is versatile enough to handle several applications, including grounds maintenance, mowing, ground leveling, lifting pallets, planting trees and shrubs as well as fencing and decorative landscaping. The multi-attachment versatility of the Toolcat makes it ideal for a variety of markets. The Toolcat was designed specifically for the needs of professionals in grounds maintenance, parks departments, municipalities, colleges and universities, schools and medical institutions, golf courses, nurseries, as well as landscape and animal farm operations. The Toolcat is equipped with a 32.8 kW Tier II compliant engine and combines all-wheel steer and 4-wheel drive in one machine. This combination gives it the ability to go through tough round conditions while still being agile enough to work in sensitive working areas, like turf and grass. With an extremely tight 5,181 mm. outside turn diameter, the Toolcat is manoeuvrable in some of the most confined areas. Another important feature on the Toolcat is its suspension system. The system is able to adjust its responsiveness according to the type of load it's carrying. It also allows the machines to travel up to 29 km per hour with comfort and control. The suspension system allows flex and axle oscillation, which helps to keep all the tyres on the ground for increased pushing force. It also aids in attachment performance, giving the operator the ability to vary down-pressure on the attachment without lifting the front wheels off the ground. Speed of the Toolcat is achieved with a 2-speed, hydrostatic drive system, which can be shifted on the move. A variable-speed drive pedal control travel functions. An engine throttle lever operates independent of the drive pedal, which allows the operator to utilise maximum attachment hydraulic flow even at low travel speeds. A digital speedometer and cruise control make it easy to repeat and maintain a specific speed, which comes in handy in many applications such as mowing, spraying and sand-spreading. The cab design incorporates operator ergonomics, safety and simple-to-use controls and is equipped with a steering wheel, drive and brake pedals, and a joystick for loader functions. In addition, the Toolcat is fitted with several safety features including a driver-side armrest equipped with an integrated Toolcat Interlock Control System (TICS), as well as a rollover protective structure (ROPS), four front-mounted work lights and seat belt restraints. Another important safety feature is the hydrostatic dynamic braking system that automatically provides stopping power to all four wheels. An enclosed cab, heater and air-conditioner are factory options. With a tray capacity of 907 kg, the Toolcat was engineered with performance as a top priority. The rear of the machine is equipped with a strong hitch that has a trailer capacity, which works great for pulling large trailers and other implements. The durable hitch is a 50 mm. receiver system, so hitch styles and offset can be matched to the implement. 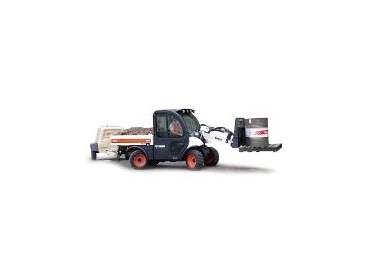 Up front, the loader has excellent lift capacity and the hydraulic system provides 68 lpm. and 20,684 kpa of auxiliary hydraulic flow to run attachments. Also available is the 5600 Turbo with hi flow option, which gives 98 lpm. of hydraulic flow allowing it to operate certain hi flow attachments. Some of the attachments available include a mower, angle broom, auger, bucket, pallet forks, trencher, tiller, utility grapple and snow blower. Switching from attachment to attachment is quick and easy with Bob-Tach attachment change system and since these attachments are front-mounted visibility is excellent.